The Unreal Tournament 2004 demo came out on February 11, 2004. Having played every entry in the Unreal franchise from the ground-breaking Unreal to the current UT2003, I was very interested to see what Epic Games, Digital Extremes, and Atari had done for the franchise. The Unreal Tournament 2004 demo came out on February 11, 2004. Having played every entry in the Unreal franchise from the ground-breaking Unreal to the current UT2003, I was very interested to see what Epic Games, Digital Extremes, and Atari had done for the franchise. 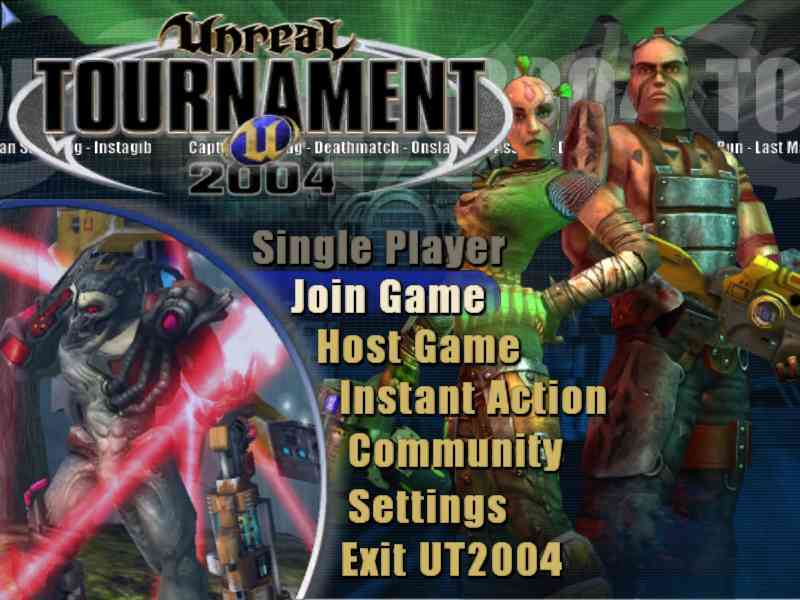 Unreal Tournament was very enjoyable, and so was UT2003, but Unreal II was a major disappointment. How would UT2004 stack up? Would it live up to the hype? More importantly, would I need to buy a new machine to play it? I’ve tweaked XP so it’s running the minimum number of services, both for security and performance purposes. The game loads quickly and displays a fancy new entry screen. Options are clearly displayed, the display’s dynamic, and the cursor is very responsive. The Settings screen has also gotten quite a makeover. There are certain settings I change for every game I buy, and those include new movement key mappings and screen settings (Brightness, for instance). I was able to make the changes with a minimum of keystrokes, which is a good thing. 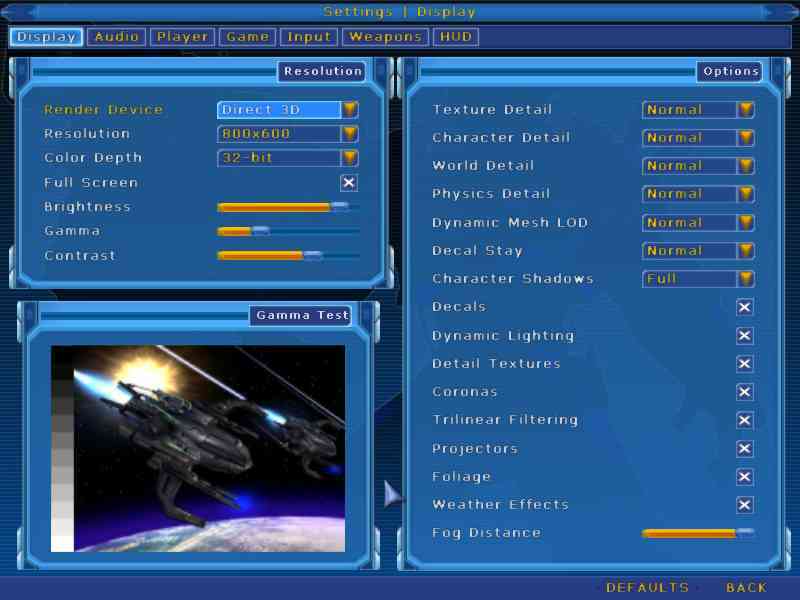 The Settings screens for Audio, Game, Input, Weapons, and HUD supports the same kind of functionality that UT2003 supports. Game includes a new feature called Speech Recognition, which I didn’t test, that’s supposed to let you control bots in a single player game with your voice. UT2004 has most of the weapons you’ve grown to love (or hate) from UT2003, such as the Redeemer, Ion Painter, Rocket Launcher, Flak Cannon, Minigun, Link Gun, Shock Rifle, Bio-Rifle, Lightning gun, and Assault Rifle. Some of those have been tweaked. The Minigun, for instance, seems to be more like UT’s Minigun than UT2003’s. Also, the Shock Rifle is more powerful than the wimpy thing we had in UT2003. The detractors can say what they want, but a combo shot takes skill, and I like seeing that skill rewarded with a swath of destruction. UT2004’s Shock Rifle isn’t as powerful as Unreal’s ASMD (how I miss that gun! ), but it’s better than UT2003’s. I was happy to see the inclusion of some new weapons. The Sniper Rifle reminds me a lot of its incarnation in Half Life Opposing Forces, which is my all time favorite sniper rifle. When you fire, smoke from the muzzle temporarily obscures your scope vision – nice touch. It’s fire rate is slow, and it gives your enemy just enough time to hurl something nasty at your camping spot. UT2004 also has a Grenade Launcher, which seems to fire grenades similar to the ones from the Assault Rifle. After the Sniper Rifle, my favorite new weapon is the AVRiL (Anti-Vehicle Rocket Launcher) that shoots what look like mini nukes. The first couple of times I used it, I didn’t know it was meant for vehicles, and I made quite a mess of some enemy bots. When you're firing at vehicles with drivers, keeping your cross hairs on the target guides the missile. Its reload rate is very slow, so don’t use this weapon in a melee. But it’s a lot of fun. The award for most cool looking new weapon is the Mine Layer. 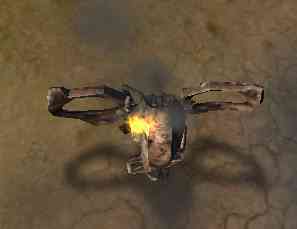 It spits out spider mines, which lay lazily about until an enemy passes. Then they swarm the unfortunate soul. Watching three or four of them vaporize an opponent warms the heart. Not quite as much fun as the remote-triggered bomb packs in Half Life, but still an enjoyable addition to the Unreal arsenal. The HUD is wildly configurable in UT2004. You can toggle the display of enemy names, weapon bar, weapon info, personal information, or VoIP Portraits. VoIP lets gamers talk to each other using headsets during gameplay. I wasn’t able to test this, but it has potential. The demo only comes with four player models: Jakob, who wears sunglasses and dreadlocks, Aryss who has an afro, Tamika who has great, uh, posture, and Othello, who looks a lot like Jakob. The Race combobox says all four belong to Thundercrash, and each character has a short biography. 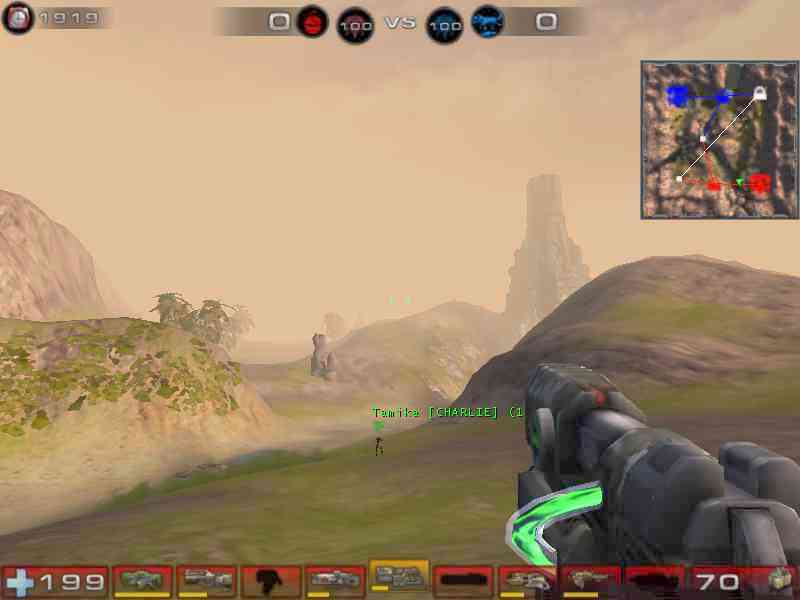 Just like with UT and UT2003, the UI lets you view the characters in a variety of ways, including 3D and with red and blue team colors. The demo comes with five game types: Assault, Onslaught, DeathMatch, Capture the Flag, Team DeathMatch, and Bombing Run. Since DeathMatch and Team DeathMatch use the same map, we only get to see five new maps. So, how do they play? The Assault map is AS-Convoy. 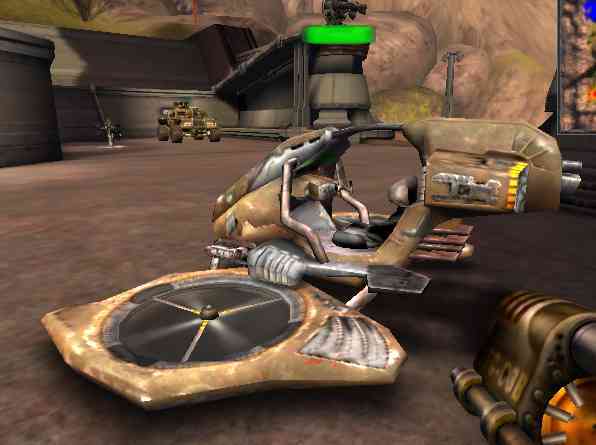 The scene is a desert planet where your enemy’s transporting stolen missiles on a big flatbed. Your jumpship has dropped you on one of the outer vehicles, and your job’s to blast your way to the missile-carrying flatbed and offload the missiles to your carrier. What struck me before I even started playing was the mission overview at the beginning of the map. The announcer does an outstanding job of walking you through the whole mission. The camera shows you the objectives as the announcer describes what you have to do. You can interrupt the overview by pressing fire. By the time the map started, I felt like I’d had a good mission briefing and was ready to go. The next thing to strike me was how huge the map is. The outdoor portion is gargantuan – the convoy drives forever in a loop, but you never have a sense that it repeats. A couple of times I found myself dead because I let the scenery distract me. Before the map started once, I tried to float to the edge of the map. I got bored after a few minutes of seeing the convey get smaller, and I never did find the edge. Game play is a lot like UT2003, with one exception – it’s smoother. I have fewer instances of video hesitation in UT2004 compared to UT2003. The announcer does a good job of telling you when you or your team achieves a goal and of reminding you what the next goal is. An arrow in the top middle of the HUD acts as a compass to point to the next objective. Also, a brief, blue ghost-like mist will show you the way you need to go after you respawn. After you successfully complete the mission, it’s your turn to defend. Weapons balance is good. The Sniper rifle is not so powerful that it’s a guaranteed single shot kill. The visuals are strong, and the objectives are difficult but obtainable. There’s plenty of cover for attacking and defending. I do understand now why the HUD menu lets you toggle various pieces off: with everything turned on, it’s easy to lose track of your cross hairs and end up missing because you’re not sure what you’re aiming at. Bot pathing isn’t great, either, in that they only take one or two routes to the objectives, so they’re easy targets. But with human teams, this map should be a lot of fun. Onslaught is a new mode for the Unreal franchise, and it’s a welcome addition. There are two teams, and each has a set of objectives. In the demo map, ONS-Torlan, each team starts with a reactor in their base. The goal is to use link guns to power up nodes that stretch between the two bases. Once you connect the nodes between the bases, you can attack the enemy’s base. If the other teams breaks the link while you're attacking, their base becomes invulnerable again, and you have to reestablish the link. Your strategy must be to both build nodes to launch your attack and to defend nodes so you don’t get flanked. Like the assault map, this map is huge. It can take quite a bit of time to hike from one area of the map to the other, but there are two ways you can get from point A to B more quickly. As you link nodes, you can teleport between them (if they're not under fire!). 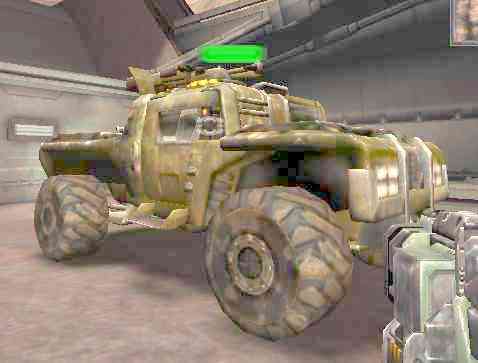 Or you can jump into another new feature of UT2004: vehicles. The Use key (by default, the U key, originally enough) lets you take control of the vehicle. In most cases, you drive the vehicle using the same keys you use to move your character. Mouse look changes the camera angle. It’s kind of tricky until you get used to it, but the controls are reasonable and quickly feel natural. 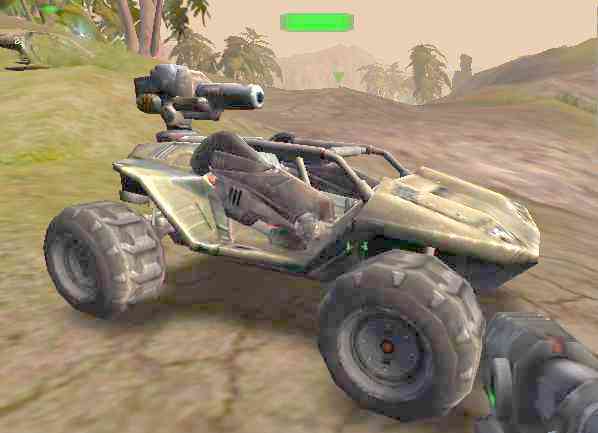 The Scorpion is a light weight general purpose vehicle that has a medium-powered weapon which fires energy masses. Ifthey don’t hit a target, they'll glow on the ground for a few moments before exploding. Pressing alt-fire reveals a surprise for foot soldiers: Blades with forward-facing edges snap out and mow down any enemies foolish enough to travel in groups – kinda like mowing chunky hay. The Scorpion is fast and maneuverable, but it doesn’t take a lot of fire to send it back to the shop for repairs. Vehicles, like people, can take only so much damage. Before jumping into a vehicle, a glowing bar above it shows how healthy it is. Goliath is a tank – literally. It’s big, it’s bulky, and its shot recovery rate is slow, but it’s a great method of crowd control. It will take a lot of damage before dying. It will also inflict a lot of damage! I found the Goliath seems to do a good job against people and the slower vehicles like Scorpion and Hellbender; it’s less effective against the faster vehicles. The Manta is a flyer that is best at low altitudes. It’s lightly armored, so it’s not a great choice for attacking something like the Goliath, but it makes a great anti-personnel weapon. Hitting alt-fire makes it drop rapidly, which is great fun when you’re hovering above an enemy. It won’t go very high, but it’s useful to harass the enemy’s Goliath or fixed position weapons. I think the vehicle that I found most challenging was the HellBender. If you jump in by yourself, you can just run your enemy over while beeping at them, because blowing the horn is all the fire button will do. That’s fun (especially with the announcer saying “Vehicular manslaughter” or my favorite, “Road kill”), but it’s not effective. If a teammate jumps in, though, they can provide anti-aircraft cover. A third teammate could man the bed-mounted cannon for even more carnage. Raptor is a high altitude, very fast fighter. It’s almost too fast – it’s very easy to overshoot your target with it. 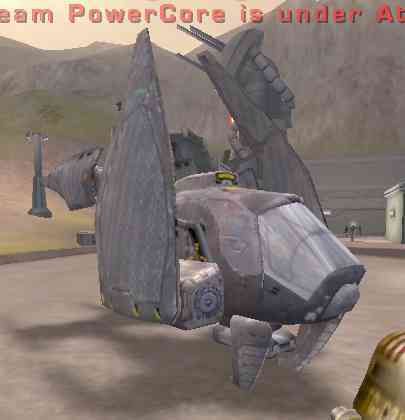 Its cannon is lightly powered, but secondary fire releases guided missiles. Raptor dogfights can be a lot of fun. A nice visual touch is when your wing tips stream vapor as you pick up speed. Smoke pouring from the tail as you take fire is another touch of realism. Onslaught is challenging type of map and it offers a lot of opportunity for strategy, tactics, and good old “killing your enemy goodness.” There are a lot of details that help the atmosphere – when you’re flying high in the Raptor, it’s almost eerie to hear the bullets slamming into the fuselage. The Manta bouncing around after its crash are a nice touch, too. Overall, this might become my favorite game mode (it had previously been CTF). The DeathMatch map, DM-Rankin, is enjoyable, but there’s not much there that’s not already in UT2003’s DM. The same holds true for the CTF map (CTF-BridgeOfFate) and the Bombing Run map (BR-Colossus). All three maps are enjoyable and well balanced, with BR-Colossus offering the most opportunity for mayhem. Dogfighting in a Raptor high above Torlan: I got into a dogfight with another Raptor above a blue power node. At once point, I was so intent on dodging fire from the other Raptor and with returning fire that I didn't see the mountain. Oops. Gravity and UT2004: The Raptor can fly high, and when it gets shot down, it ejects you from the cockpit. It's a long, long way down! So far down that I could barely see my body crunch and roll when it slammed into the dirt. Frenzied Attacks: Again in Torlan, I spawned at a red power node as it came under coordinated attack. On the mountain, a sniper tried to pick off me and my team mates (all bots). Behind my left shoulder, one of my teammates had jumped in the Goliath and was returning fire. 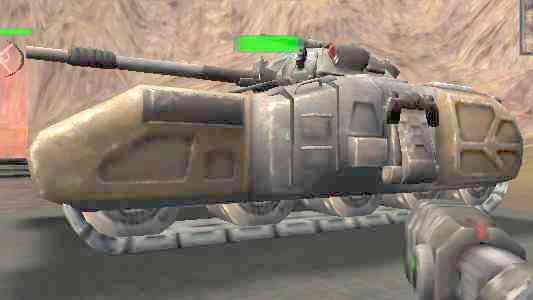 I ran for the fixed gun turret to help as a Raptor began a strafing run; tank shells exploded all around me. As I began firing from the turret, I saw a blue team Mantra start a suicide run that killed me and destroyed the turret. All of this happened in about three seconds. Wow. A note about the Mac version: I have an iBook G3 900Mhz with 256Mb of RAM. I installed the demo version and tried to run it. The good news is that even with the stock video card (ATI RageM7 with 32Mb of RAM), the game looks great when rendered via OpenGL. The bad news is that the game was a beautiful slide show. It was absolutely unplayable. My guess it that a dual processor G5 and a more powerful video card would make playing the game an enjoyable experience. Note that there’s also a Linux client version available. There are a number of features that I didn’t review, like UnrealTV, Voice over IP, and server play. My goal was to go through the basics of the maps and see how well UT2004 compares to UT2003. It adds the right kinds of things: Onslaught, the new map type, is challenging and complex without being prohibitively difficult; vehicles add a level of intensity to the maps, since you now have to worry about attacks from all directions; and the new weapon types like AVRiL off set the danger posed by the vehicles. It keeps the right kind of things: UT2003 did a lot right, like gameplay, beautiful visuals, and solid net code. UT2004 keeps all of those things. The only change I could find in some of those core game aspects was that UT2004 was actually smoother on my system. 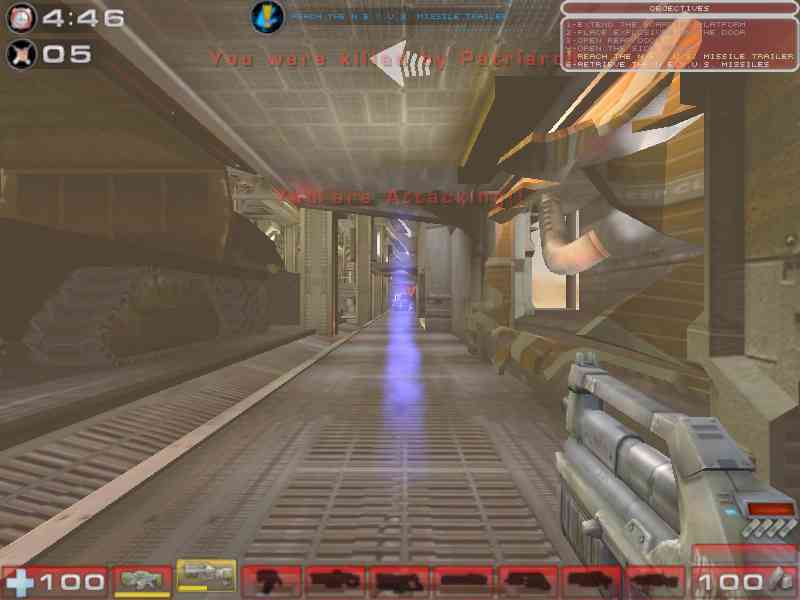 UT2004 looks to be an entertaining addition to the world of PC Gaming. It seems to make business sense: add new game types, player classes, and vehicles each year kinda the way the Madden football series does. It gives us gamers something to look forward to, it gives developers and mod writers a stable platform upon which they can build, and it provides a steady stream of income for Epic, Digital Extremes, and Atari. Everyone wins!